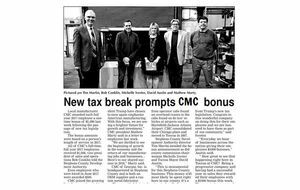 Local manufacturer CMC awarded each full year 2017 employee a one-time bonus of $1,000 last week following the passage of new tax legislation. The bonus amounts were based on a person’s length of service in 2017. All of CMC’s full-time, full year 2017 employees received $1,000, VP of Sales & Operations Bob Conklin told the Stephens County Development Authority. Even employees who were hired in June 2017 were awarded $500. CMC of Georgia, Inc. is headquartered in Stephens County and is both an OEM supplier and a custom metal fabricator. They provide fabricated metal parts and assemblies from small to large, and simple to complex. Their products range from operator cabs found on overhead cranes to the cabs found on de-icer vehicles at airports such as Hartsfield-Jackson Atlanta Airport. CMC consolidated their Chicago plant and moved to Toccoa in 2007. The Stephens County Development Authority is responsible for the recruitment of new businesses including industrial, manufacturing, distribution, corporate and regional headquarters and customer service centers as well as working with existing businesses and industries to ensure their continued success. It also provides support and assistance with all other types of economic development projects in both the City of Toccoa and Stephens County. "This is monumental for this Stephens County business. This money will most likely be spent right here in our county. It's a win win for all of us as citizens when a company steps up and honors their employees with the rewards they will receive from Trump's new tax legislation. Congrats to this wonderful company on doing this for their employees and we are honored to have them as part of our community." "Everyday we hear of businesses across the nation giving their employees $1000 bonuses. How great to see that happening right here in Toccoa at CMC! Being a progressive company and having had a successful year in sales they rewarded their employees with a $1000 bonus this week. They are to be commended for their action and I thank them for being a vital part of our business community."